Landslides cause fatalities and billions of dollars in property damage each year. Adapted from United States Geological Survey Fact Sheet 2004-3072. Landslide Map: This map shows the distribution of relative landslide incidence and susceptibility across the conterminous United States. Red areas have the highest rates of landslide incidence. Pink areas have high rates of landslide incidence and susceptibility. Map by the United States Geological Survey. Enlarge Image. the hilly to mountainous parts of Kentucky, North Carolina, Pennsylvania, Tennessee, Virginia, and West Virginia that are underlain by shale bedrock. These three regions can easily be identified in the accompanying map by their high concentrations of red and pink color. 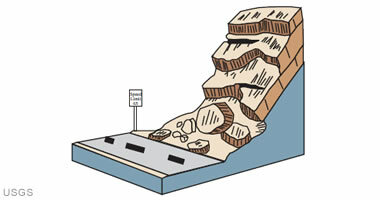 Alaska and Hawaii also experience many types of landslides. Landslide Video: This USGS video explains some of the differences between various types of landslides and describes some landslide science activities of USGS. In the typical year, landslides in the United States cause billions of dollars in property damage and kill dozens of people. Casualties in the United States are primarily caused by rockfalls, rockslides, and debris flows. Worldwide, landslides cause thousands of casualties and result in many billions in monetary losses each year. The information presented here is an introduction to the landslide process, a presentation of the different types of landslides, and an introduction on how landslides can be mitigated and managed as a hazard. 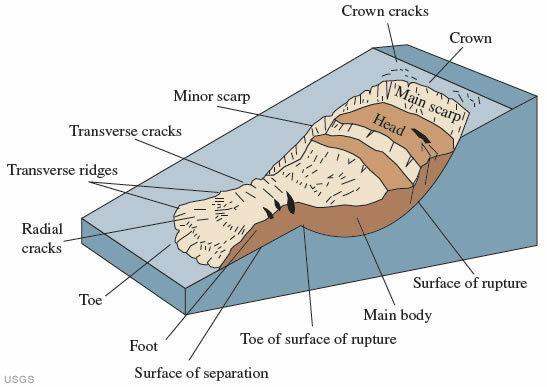 Landslide Anatomy: An idealized slump / earth flow showing commonly used nomenclature for labeling the parts of a landslide. Enlarge image. The term "landslide" describes a wide variety of processes that result in the downward and outward movement of slope-forming materials including rock, soil, artificial fill, or a combination of these. The materials may move by falling, toppling, sliding, spreading, or flowing. 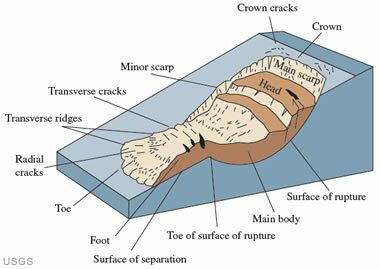 The accompanying image is a graphic illustration of a landslide, with the commonly accepted terminology describing its features. Although landslides are primarily associated with mountainous regions, they can also occur in areas of generally low relief. In low-relief areas, landslides occur as cut-and-fill failures (roadway and building excavations), river bluff failures, lateral spreading landslides, collapse of mine-waste piles (especially coal), and a wide variety of slope failures associated with quarries and open-pit mines. 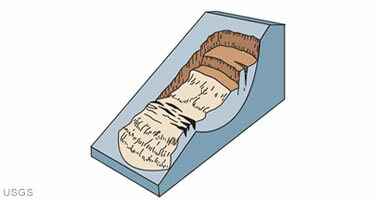 The most common types of landslides are described and illustrated on this page. Rotational slide: This is a slide in which the surface of rupture is curved concavely upward, and the slide movement is roughly rotational about an axis that is parallel to the ground surface and transverse across the slide. Although many types of mass movements are included in the general term "landslide," the more restrictive use of the term refers only to mass movements, where there is a distinct zone of weakness that separates the slide material from more stable underlying material. The two major types of slides are rotational slides and translational slides. Slide types and descriptions are illustrated on this page. Block slide: A translational slide in which the moving mass consists of a single unit or a few closely related units that move downslope as a relatively coherent mass. Translational slide: In this type of slide, the landslide mass moves along a roughly planar surface with little rotation or backward tilting. 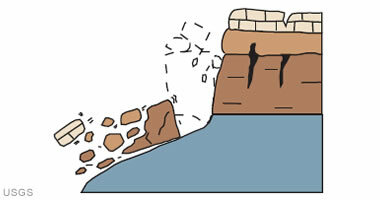 Rockfall: Falls are abrupt movements of masses of geologic materials, such as rocks and boulders, that become detached from steep slopes or cliffs. Separation occurs along discontinuities such as fractures, joints, and bedding planes, and movement occurs by free-fall, bouncing, and rolling. Falls are strongly influenced by gravity, mechanical weathering, and the presence of interstitial water. A rockfall is a sudden fall or collapse of a large mass of material from a precipitous position. Rockfalls occur along cliffs or very steep slopes where masses of rock can detach and begin a free-fall, often combined with a bouncing or rolling descent. No slip-plane or surface of flow is involved. Rockfalls are rapid, and because of their speed and sudden occurrence, they are very dangerous. They often occur in the spring as freeze-thaw actions loosen jointed rocks. Topple: Toppling failures are distinguished by the forward rotation of a unit or units about some pivotal point, below or low in the unit, under the actions of gravity and forces exerted by adjacent units or by fluids in cracks. Debris flow: A debris flow is a form of rapid mass movement in which a combination of loose soil, rock, organic matter, air, and water mobilize as a slurry that flows downslope. Debris flows include less than 50% fines. Debris flows are commonly caused by intense surface-water flow, due to heavy precipitation or rapid snowmelt, that erodes and mobilizes loose soil or rock on steep slopes. Debris flows also commonly mobilize from other types of landslides that occur on steep slopes, are nearly saturated, and consist of a large proportion of silt- and sand-sized material. Debris-flow source areas are often associated with steep gullies, and debris-flow deposits are usually indicated by the presence of debris fans at the mouths of gullies. Fires that denude slopes of vegetation intensify the susceptibility of slopes to debris flows. Debris avalanche: This is a variety of very rapid to extremely rapid debris flow. There are five basic categories of flows that differ from one another in fundamental ways. Flow types and descriptions are illustrated on this page. Although there are multiple types of causes of landslides, the three that cause most of the damaging landslides around the world are (1) water; (2) seismic activity; and (3) volcanic activity. These are discussed in the sections below. Earthflow: Earthflows have a characteristic "hourglass" shape. 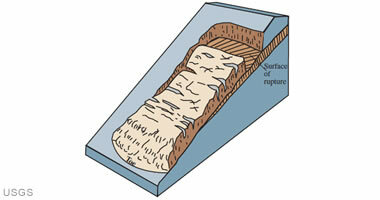 The slope material liquefies and runs out, forming a bowl or depression at the head. The flow itself is elongate and usually occurs in fine-grained materials or clay-bearing rocks on moderate slopes and under saturated conditions. However, dry flows of granular material are also possible. Mudflow: A mudflow is an earthflow consisting of material that is wet enough to flow rapidly and that contains at least 50 percent sand-, silt-, and clay-sized particles. In some instances, for example in many newspaper reports, mudflows and debris flows are commonly referred to as "mudslides." Lateral Spreads: Lateral spreads are distinctive because they usually occur on very gentle slopes or flat terrain. 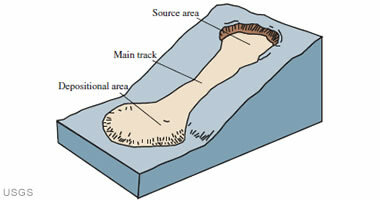 The dominant mode of movement is lateral extension accompanied by shear or tensile fractures. The failure is caused by liquefaction, the process whereby saturated, loose, cohesionless sediments (usually sands and silts) are transformed from a solid into a liquefied state. Failure is usually triggered by rapid ground motion, such as that experienced during an earthquake, but can also be artificially induced. When coherent material, either bedrock or soil, rests on materials that liquefy, the upper units may undergo fracturing and extension and may then subside, translate, rotate, disintegrate, or liquefy and flow. 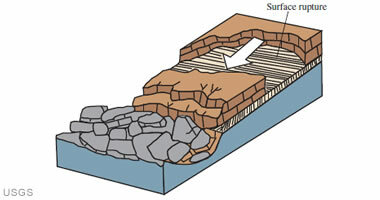 Lateral spreading in fine-grained materials on shallow slopes is usually progressive. The failure starts suddenly in a small area and spreads rapidly. Often the initial failure is a slump, but in some materials movement occurs for no apparent reason. 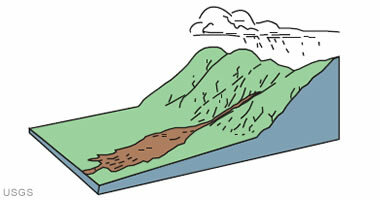 Combination of two or more of the above types is known as a complex landslide. Creep: Creep is the imperceptibly slow, steady, downward movement of slope-forming soil or rock. Movement is caused by shear stress sufficient to produce permanent deformation, but too small to produce shear failure. There are generally three types of creep: (1) seasonal, where movement is within the depth of soil affected by seasonal changes in soil moisture and soil temperature; (2) continuous, where shear stress continuously exceeds the strength of the material; and (3) progressive, where slopes are reaching the point of failure as other types of mass movements. Creep is indicated by curved tree trunks, bent fences or retaining walls, tilted poles or fences, and small soil ripples or ridges. 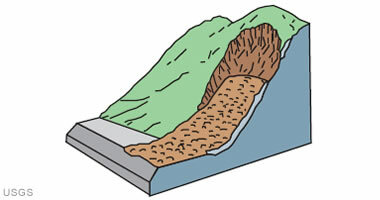 Slope saturation by water is a primary cause of landslides. This effect can occur in the form of intense rainfall, snowmelt, changes in groundwater levels, and water level changes along coastlines, earth dams, and the banks of lakes, reservoirs, canals, and rivers. Landsliding and flooding are closely allied because both are related to precipitation, runoff, and the saturation of ground by water. In addition, debris flows and mudflows usually occur in small, steep stream channels and often are mistaken for floods; in fact, these two events often occur simultaneously in the same area. Landslides can cause flooding by forming landslide dams that block valleys and stream channels, allowing large amounts of water to back up. This causes backwater flooding and, if the dam fails, subsequent downstream flooding. Also, solid landslide debris can "bulk" or add volume and density to otherwise normal streamflow or cause channel blockages and diversions, creating flood conditions or localized erosion. Landslides can also cause overtopping of reservoirs and/or reduced capacity of reservoirs to store water. Many mountainous areas that are vulnerable to landslides have also experienced at least moderate rates of earthquake occurrence in recorded times. The occurrence of earthquakes in steep landslide-prone areas greatly increases the likelihood that landslides will occur, due to ground shaking alone or shaking- caused dilation of soil materials, which allows rapid infiltration of water. The 1964 Great Alaska Earthquake caused widespread landsliding and other ground failure, which caused most of the monetary loss due to the earthquake. Other areas of the United States, such as California and the Puget Sound region in Washington, have experienced slides, lateral spreading, and other types of ground failure due to moderate to large earthquakes. Widespread rockfalls also are caused by loosening of rocks as a result of ground shaking. Worldwide, landslides caused by earthquakes kill people and damage structures at higher rates than in the United States. Landslides due to volcanic activity are some of the most devastating types. Volcanic lava may melt snow at a rapid rate, causing a deluge of rock, soil, ash, and water that accelerates rapidly on the steep slopes of volcanoes, devastating anything in its path. These volcanic debris flows (also known as lahars) reach great distances, once they leave the flanks of the volcano, and can damage structures in flat areas surrounding the volcanoes. The 1980 eruption of Mount St. Helens in Washington triggered a massive landslide on the north flank of the volcano, the largest landslide in recorded times. 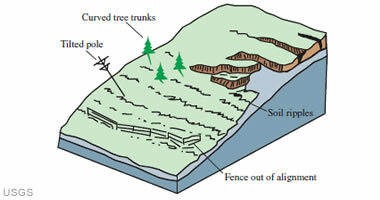 For more information about landslides, visit the USGS National Landslide Hazards Program website. For information about landslides in your local area, contact the geological survey for your state or country. Vulnerability to landslide hazards is a function of location, type of human activity, use, and frequency of landslide events. The effects of landslides on people and structures can be lessened by total avoidance of landslide hazard areas or by restricting, prohibiting, or imposing conditions on hazard-zone activity. Local governments can reduce landslide effects through land-use policies and regulations. Individuals can reduce their exposure to hazards by educating themselves on the past hazard history of a site and by making inquiries to planning and engineering departments of local governments. They can also obtain the professional services of an engineering geologist, a geotechnical engineer, or a civil engineer, who can properly evaluate the hazard potential of a site, built or unbuilt. The hazard from landslides can be reduced by avoiding construction on steep slopes and existing landslides, or by stabilizing the slopes. Stability increases when groundwater is prevented from rising in the landslide mass by (1) covering the landslide with an impermeable membrane, (2) directing surface water away from the landslide, (3) draining groundwater away from the landslide, and (4) minimizing surface irrigation. Slope stability is also increased when a retaining structure and/ or the weight of a soil/rock berm are placed at the toe of the landslide or when mass is removed from the top of the slope. The original USGS fact sheet was compiled and designed by Lynn Highland and Margo Johnson.